Some of us have been yearning for a knit-crochet gathering. Well, we are having a mid-summer, mid-day knit-crochet circle on Monday, August 4th, noon to 3:00, at the Disciples’ Den. (August 4th is really the mid-point of summer.) Child care will be offered in the church nursery. Bring your lunch and some stitching, and I will bring a lemonade pie. Faith and Family Night with the Southern MD Blue Crabs baseball team in Waldorf will be Sunday, August 10 at 2:05 pm. It is sponsored by Thrivent who is offering field box tickets at $7.00 per person (regularly $13.00). If you are interested in joining a group from Good Sam at the ballgame, please see Diane H. no later than Wed., August 6. You are welcome to bring friends. 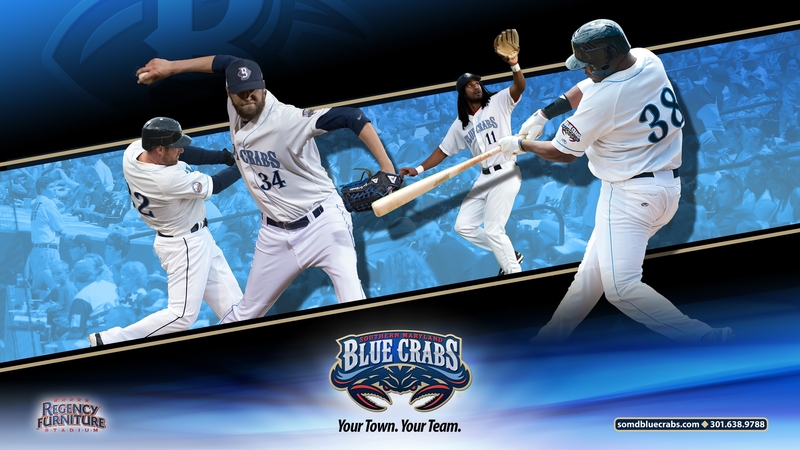 The Southern MD Blue Crabs’ website is available here. We will be having a final VBS setup and planning meeting Sunday, July 27 from 2:00-4:00 pm. If you are planning to volunteer, we need to see you and make sure that you have an assignment that you are comfortable with. If you are teaching, we would like to give you time to set up your area and make any copies, changes, and address last minute requests that you have. Sunday afternoon is the time to plan, rather than Monday morning with kids! Empty Nesters will gather at Rob and Judy K.’s home at 3 pm on Sunday, August 31 for a pool party. We had such a great time last year we are repeating it again. Please bring your own meat to grill and a dish to share. We will have a basket on the table to collect $5 per person to cover the cost of our silent auction donation of $61. Iced tea, lemonade, paper products, and condiments will be provided. Feel free to bring beer or wine. Let us know that you will be attending and what dish you will be sharing. We want to make sure that we don’t get all desserts or all broccoli salads. Send an email to emptynesters@goodsamlutheran.com or just talk with Jill or Diane at church. We look forward to seeing you all there! Youth to Teen is a community youth group in St. Mary’s County, serving the areas of California, Great Mills, and Lexington Park. Its goal is to train children on the importance of community service. Most of the children involved come from single-parent homes or are being raised by grandparents. Their ages range from 5 to 13. Although the children may be undergoing obstacles, the goal is to instill faith, hope, and love. 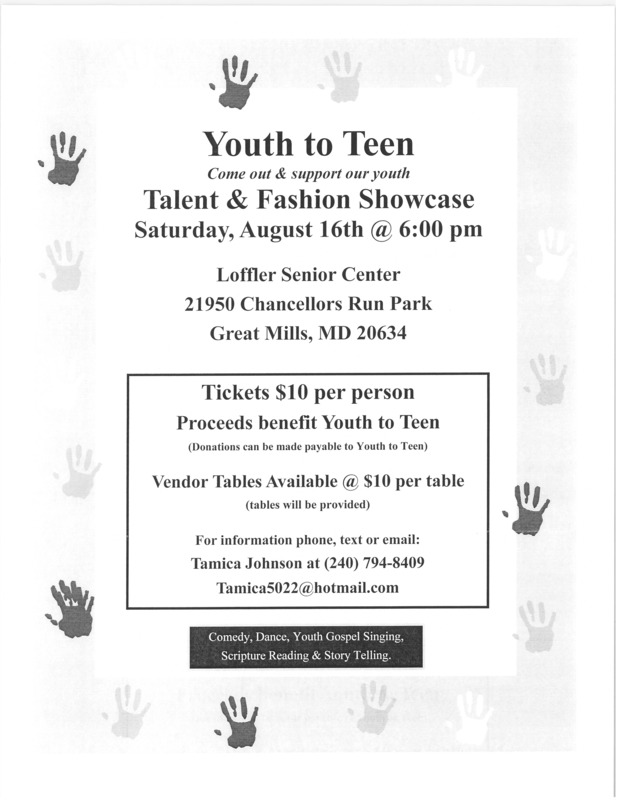 To raise money to support the children’s mission, a Talent/Fashion showcase will be held on Saturday, August 16 at 6:00 pm at the Loffler Senior Center in Chancellor’s Run Regional Park (Great Mills, MD). Please see the flyer below. The children will be the performers and models. Tickets are $10 per person. There will also be local vendors at this event. The proceeds will be used to purchase back-to-school items, a trip to King’s Dominion and to take the show on the road to local nursing homes, senior centers and hospice agencies. As small groups and ministries prepare for the fall, we ask that you let the church office know when you will begin meeting again. We’d like to keep the calendar up-to-date – whether your gathering is here at this location, or in the community at homes or businesses. Let us know when and where you will meet, as well as the frequency of your gatherings. Please email or call the church office with the information: office@goodsamlutheran.com or 301-863-4740. Thanks for your help! The community garden is looking for donations of newspaper, and for volunteers to help with weeding and putting down newspaper. Please see Anita P. with questions or for more information. “Hospitality” Do you know this art? Over the years I have seen so many different styles and traditions around hospitality. Some homes offer hospitality with great intention and others seem to give it hardly a thought. Welcome and invitation are just a few of the ingredients of good hospitality. When it comes to the Feast of the Altar – hospitality also matters. Welcome and invitation along with clarity about what is being offered are essential at the Altar of God. In the Communion meal we offer to share Jesus. We do this with his instruction and by his request. There is great community and hospitality in Jesus, so of course we invite all to share with us in this feast. Perhaps you will share “invitation and welcome” with the friend that you bring with you to worship for a visit. They too are included in Jesus’ invitation to feast upon the life that God gives at this table. Indeed, All Are Welcome! Have you noticed our sign on Great Mills? We try to publicize this quality of our life but we depend upon you to express it and live it out. We invite you to practice hospitality here at church as well as at home. Is it possible that what so many would consider a weed, might actually bear fruit that is to God’s glory? Look how close rice grain looks to a non-fruit bearing plant called Tears. 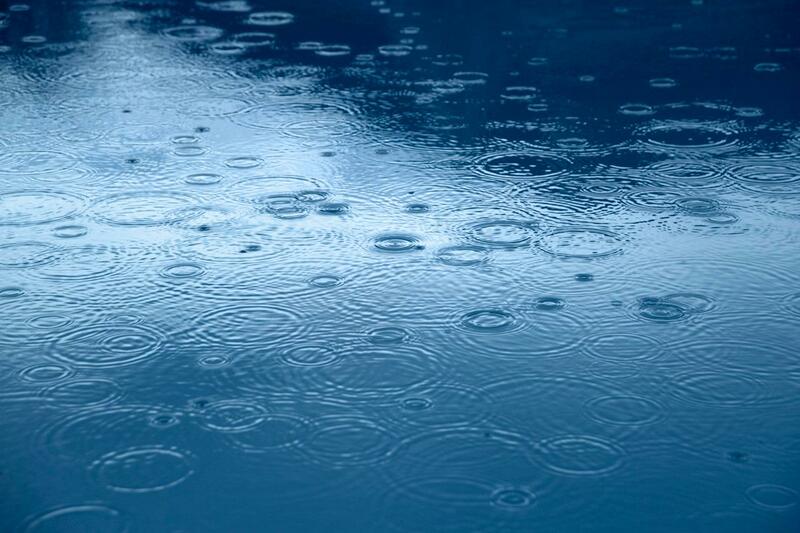 First Reading: Isaiah 55:10–13 (Click to go directly to the NIV Bible Text) God’s word to Israel’s exiles is as sure and effective as never-failing precipitation. Their return to the Holy Land in a new exodus is cheered on by singing mountains and by trees that clap their hands. Second Reading: Romans 8:1–11 There is no condemnation for those who live in Christ. God sent Christ to accomplish what the law was unable to do: condemn sin and free us from its slavery. The Spirit now empowers proper actions and values in our lives and gives us the promise of resurrected life. Gospel: Matthew 13:1–9, 18–23 In Matthew’s gospel, both Jesus and his disciples “sow the seed” of God’s word by proclaiming the good news that “the kingdom of heaven is near.” Now, in a memorable parable, Jesus explains why this good news produces different results in those who hear.